As debuted on Yachting World; new footage of the Spirit 47CR cruising yacht’s build to date. Responding to significant interest in modern classic yachts with increased volume for leisure sailing, Spirit Yachts has designed a new range of cruising yachts, including the 47CR and 55CR. The latest video from the yard shows the first build in the range, a 47CR, well underway with her launch planned later this year. 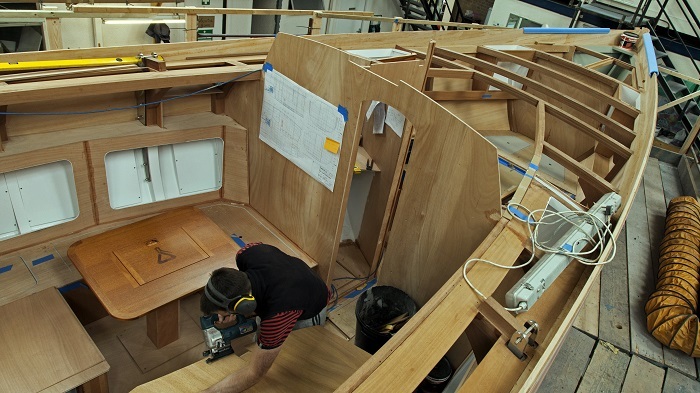 Captured on a time lapse camera over a period of three months, the Spirit 47CR footage shows the dedicated Spirit Yachts’ team of expert boat builders at work and the build progress to date; including creation of the hull and its ‘roll-over’ ready for fit out. Watch the film by clicking here and find out more detail on the build process below. Spirit 47CR in build, photo credit: Mike Bowden. As with all Spirit yachts, hull construction of a 47CR begins with laminating wooden (Sapele) ring frames with an extraordinary degree of accuracy over full size computer generated patterns. The ring frames and bulkheads are then positioned onto a ‘strongback’ before the centreline configuration is laminated as one continuous structure. The beam shelves are then fitted before the whole assembly is meticulously bevelled and faired to take the first fore and aft layer of Douglas fir strip planking. On the larger Spirits the central frames are reinforced with laser-cut stainless steel inner frames to take the loads of the mast, chainplates and high aspect lead keel below. The hull planking is then reinforced by the application of double-diagonal khaya veneers, epoxy bonded at 90° to the first layer of planking, before the whole hull is covered with an epoxy glass sheath and vacuum bagged. 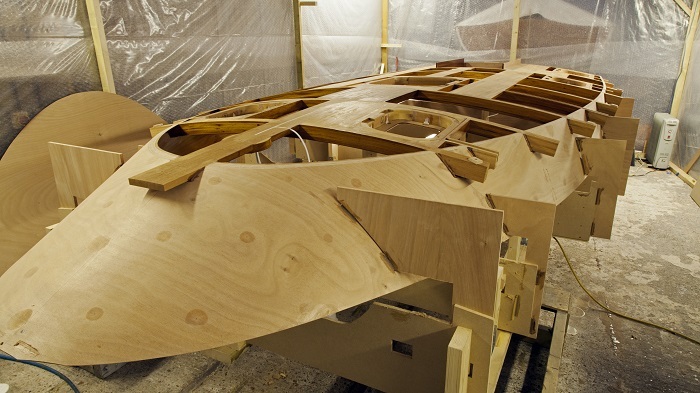 This last phase stabilises the timber to allow for the perfect hull paint finish Spirit Yachts is noted for. Fitting out the hull of the Spirit 47CR. Photo credit: Mike Bowden. Spirit 47CR’s coachroof under construction, photo credit: Mike Bowden. Having been rolled over, and as shown in the images above, the Spirit 47CR hull is now in the process of being fitted out. Keep an eye on our Facebook and Twitter pages for regular updates.